Too cold for grilling outdoors? Although grilling time is just around the corner, there are fans of baked ribs. And, there's a multitude of interest -- regardless of the season -- in chocolate cake, especially when it's the Tunnel of Fudge Cake, an American classic developed for the Pillsbury Bake-Off in 1966 (recipe below). When P.W. requested a baked ribs recipe, Judy Heim of Orland Park was willing to share her favorite Best Baby Back Ribs. She follows the same recipe for country ribs and pork chops and loves her sauce over mashed potatoes. When it comes to ribs, there is nothing more important than starting with exceptionally meaty and lean ribs -- that's where you need to trust your butcher or meat department. If you desire even more flavor, use one of the many commercial dry rubs on the market. 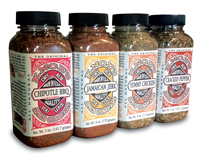 My personal recommendations are Knox's Chipotle B-B-Q Dry Rub (see www.knoxspice.com), made in Chicago, or the outstanding BBQ rubs (Island Spice or All-Purpose) created by the king of BBQ Steven Raichlen (see www.bestofBBQ.com). If you want an easier way out, follow Heim's recipe (below) for baking ribs and then use about 3 cups of your favorite commercial BBQ sauce or try Raichlen's Chipotle Molasses BBQ Sauce (available at Marshall Field's). Cut ribs into individual pieces. Place in a 13x9x2-inch pan and bake for 30 minutes. Meanwhile, combine ketchup, Worcestershire, salt, pepper, water and chili powder. Bring ingredients to boil in a deep saucepan. Drain excess fat from ribs, and then sprinkle lemon juice over ribs. Turn oven down to 350 degrees. Pour sauce over ribs and bake 1 hour. Remove ribs to platter; pour additional sauce over ribs. Grease and flour 12-cup Bundt pan or 10-inch tube pan. In large bowl, combine sugar and margarine or butter; beat until light and fluffy. Add eggs one at a time, beating well after each addition. Gradually add 2 cups confections' sugar; blend well. By hand, stir in flour, cocoa and chopped walnuts until well blended. Spoon batter into greased and floured pan; spread evenly. Bake for 45 to 50 minutes or until top is set and edges are beginning to pull away from edge of pan. Cool upright in pan on wire rack 90 minutes; invert onto serving plate. Cool for at least 2 hours. To make glaze: In small bowl, combine all glaze ingredients, adding enough milk for desired drizzling consistency. Spoon over top of cake, allowing some to run down sides. Store tightly covered. Copyright 2006 Chicago Sun-Times, Inc.